We read with interest recent papers reporting on the impact of gut microbiota on several aspects of health and disease due to altered intestinal permeability resulting in systemic immune activation by pathogen-associated molecular patterns (PAMP), a process termed microbial translocation.1–4 Common to these studies is the analysis of systemic lipopolysaccharide (LPS), the major outer membrane PAMP of Gram-negative bacteria, to quantitatively assess microbial translocation. While systemic LPS is typically regarded as a soluble product, either or not neutralised by lipoproteins and endotoxin core antibodies, LPS is also released as a membrane-associated PAMP through extracellular vesicles (EV).5–7 Bacterial EV are nanometre-sized membrane particles transporting nucleic acids, metabolites, proteins and endotoxins.8 As such, bacterial EV that enter the systemic circulation may deliver and elicit a variety of immunological and metabolic responses in different organs including the brain.9 To date, the systemic presence and activity of bacterial EV in patients with intestinal barrier dysfunction have not been investigated. Here, we fractionated plasma of 49 subjects to distinguish bacterial EV-associated LPS from other LPS products (online supplementary file 1). Online supplementary table 1 summarises individual patient characteristics; 25 donors asymptomatic of intestinal barrier dysfunction (12 healthy volunteers and 13 patients with cancer during chemotherapy without GI side effects suggestive for intestinal mucositis) and 24 patients with clinically well-defined intestinal barrier dysfunction (13 patients with IBD, 5 patients with cancer with radiation or chemotherapy-induced intestinal mucositis and 6 treatment-naive patients with HIV). We quantitatively measured bacterial EV-associated LPS and other LPS products by performing limulus amoebocyte lysate (LAL) and Toll-like receptor 4 (TLR4) reporter assays and qualitatively confirmed the results by immunoelectron microscopy (online supplementary figure 1). We combined size exclusion chromatography and density gradient (DG) centrifugation to fractionate plasma LPS in two dimensions to separate bacterial EV-associated LPS from other LPS products (online supplementary figures 2 and 3). LAL analysis of DG fraction 5 (1.141–1.186 g/mL), corresponding to the density of bacterial EV (online supplementary figure 2), demonstrated significantly increased LPS activity in patients diagnosed with HIV, IBD and therapy-induced intestinal mucositis compared with respective controls (figure 1A–C). LAL analysis of the lower density fractions (1.041–1.068 g/mL), containing other LPS products, revealed no significant difference (online supplementary figure 4). In accordance, we detected elevated amounts of microbial pattern recognition receptor ligands by determining TLR4 agonistic activity in DG fraction 5 of patients with intestinal barrier dysfunction (figure 1D). Immunoelectron microscopy confirmed bacterial EV-associated LPS in DG fraction 5 (figure 1E). Quantitative and qualitative assessment of lipopolysaccharide (LPS)-positive bacterial extracellular vesicles (EV) isolated from plasma of patients with intestinal barrier dysfunction. (A–C) Box and whisker plots of LPS activity levels, (D) z-score transformation of Toll-like receptor 4 (TLR4) agonistic activity levels, and (E) immunoelectron microscopy analysis (scale bar=200 nm) of systemic bacterial EV in patients diagnosed with HIV, IBD and cancer therapy-induced intestinal mucositis compared with respective controls (each block represents one individual). (F) Correlation analysis between plasma zonulin and bacterial EV-associated LPS activity levels (Spearman’s r=0.4241, p=2.45×10−2). EU, endotoxin unit. 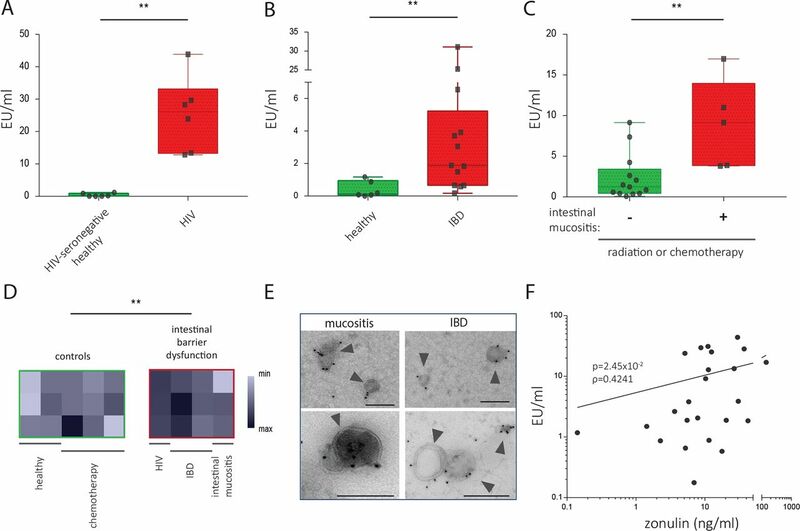 Zonulin, a biomarker of barrier integrity, initiates phosphorylation of zonula occludens proteins and leads to tight junction disassembly and increased intestinal permeability.10 The level of bacterial EV-associated LPS significantly correlated with plasma zonulin levels, suggesting an association with intestinal barrier integrity (figure 1F). Indeed, compromising tight junction integrity in an in vitro colitis model induced paracellular translocation of bacterial EV (online supplementary figure 5). We calculated that the human gut harbours approximately 1014 bacterial EV which may serve as a substantial source of systemic PAMP, evidenced by proteomic analysis of faeces-derived bacterial EV (online supplementary figure 6D,E). Additionally, bacterial EV strongly stimulated secretion of proinflammatory cytokines (such as interleukin (IL)-6, IL-8, MCP-1 and MIP-1α) by peripheral blood mononuclear cells, whereas the secretion of receptor antagonists (such as IL-1RA) was not stimulated, indicating potent systemic aspects (online supplementary figure 6F). In conclusion, LPS-positive bacterial EV are present in plasma, are able to induce immune activation and correlate with impaired barrier integrity in patients diagnosed with IBD, HIV and cancer therapy-induced intestinal mucositis (figure 2). Further studies are needed to understand systemic functions of circulating bacterial EV, to study their biomarker potential and to identify and correlate their taxonomy to the metabolic activity status of gut microbiota. 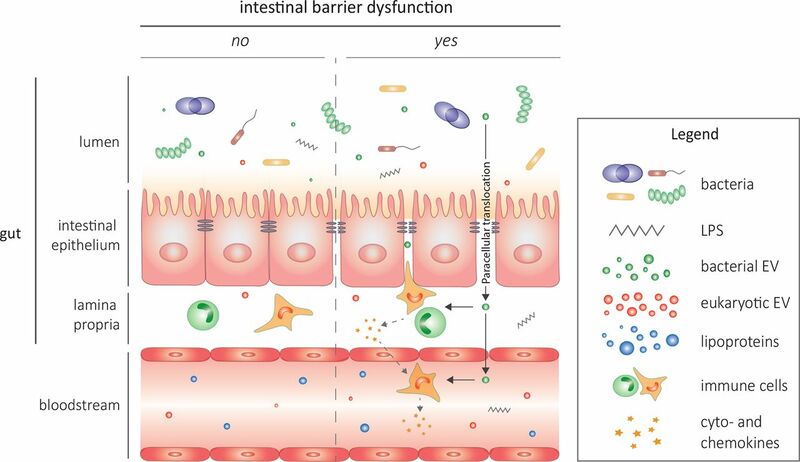 Intestinal barrier dysfunction opens the door for bacterial EV-associated LPS and other LPS products to enter the systemic circulation and induce immune activation. EV, extracellular vesicles; LPS, lipopolysaccharide.
. Lipopolysaccharide (LPS) binding protein catalyzes binding of LPS to lipoproteins. Prog Clin Biol Res 1995;392:287–95.
. Haemophilus influenzae outer membrane vesicle-induced blood-brain barrier permeability during experimental meningitis. Infect Immun 1989;57:2559–62. Contributors Study concept and design: JT, JV, ODW and AH. Acquisition, analysis or interpretation of data: All authors. Drafting of the manuscript: JT, ODW and AH. Critical revision of the manuscript for important intellectual content: All authors. Funding This work was supported by concerted research action from Ghent University and Krediet aan Navorsers from the Research Foundation Flanders (FWO). JVD, EG, LV and AH are supported by fellowships from FWO. Ethics approval Ethical Committee of Ghent University Hospital.